The Advances in Neuroblastoma Research 2006 conference took place from Wednesday, May 17th 2006 through Saturday, May 20th 2006 in Los Angeles, California. Photo galleries will open in a new window. 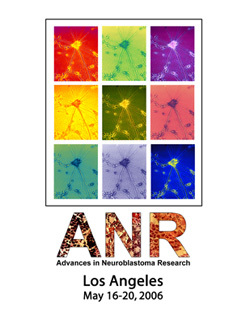 Click on the thumbnail on your right to download the ANR 2006 Meeting poster. Left-click on the links to play the songs on your computer's default mp3 player. Right-click and choose "Save Target As..." (in Internet Explorer) or "Save Link As..." (in Firefox) to download the files and save them to your hard drive. ANR Meeting: The Movie is here! Please click here or on the animated pic above to view or download the movie.